Anyone looking for a snow shovel that can take a lot of punishment, yet will still be able to shovel huge amounts of snow quickly when required, without breaking, year after year. 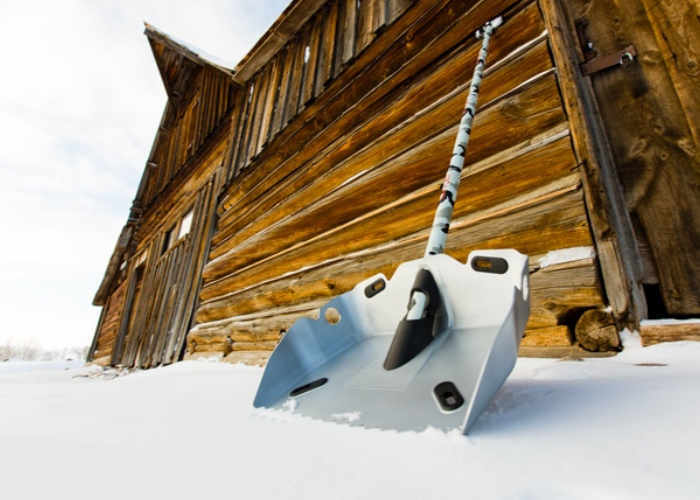 May be interested in the Alpha Shovel which has been created by the DMOS Collective, and follows on from their previous popular snow shovel the Stealth. Check out the video below to learn more about this aluminium snow shovel which is fully collapsible and easily to transport whether on your back or in your car. The Alpha snow shovel has this week launched on Kickstarter and is available for earlybird backers from just $79. Its creators explain a little more about the inspiration and construction of the ultimate snow shovel which has been designed for both shovelling and cutting through hard surfaces. Hardware store shovels and rakes come in steel, plastic, and aluminum and most people have a whole quiver of them for different applications. DMOS’s design approach is to build an all-terrain, all-season shovel multi-tool. The first of its kind that is a shovel for snow and dirt, a combination rake/hoe, and, with teeth, a shovel that requires less leverage and force to penetrate hard pack dirt and snow. We make tools that are portable, with shafts that are indestructible, with blades that don’t bend or break. We’ve built a shovel multi-tool that, if you were only going to buy one, and pass it down for a generation, you’d pick this one. It’s bomber. Superior performance. Traditional shovels don’t provide enough leverage, ergonomics, and few are durable enough to last more than one season. The handles break, the plastic cracks, or the metal bends and curls. Metal shovels have small heads and are heavy, meaning they take forever to clear a path or parking space. Plastic shovels have bigger and lighter heads but are way less durable, so you have to be gentle while using them so they don’t break. The Alpha Shovel is the ultimate all-terrain multi-shovel tool for all the adventurers, handymen, and just about everyone out there. Merging quality craftsmanship with globally inspired design, we’re bringing you the snow shoveling solution you’ve been looking for.